Hurricane season is just something we deal with in the South. We hear the names of each hurricane roll in alphabetically from July through October. The news stations always get very excited and usually get us more worried than necessary. In all of my years living on the coast of NC I have never been through a big storm that had an impact on my life. I had ignored all conversations about hurricane Florence until about 4 days before she was meant to make landfall with a direct hit on my town of Wilmington, NC as a category 4. The thing that was so scary about Florence was that she was huge, slowly moving across the Atlantic, while also spinning very fast at 150 miles per hour. On Wednesday morning Marc, the kids and our Boston Terrier, Mattie, evacuated inland to Charlotte and stayed with my Grandmother for 5 days. I was officially scared. Enjoying a Pilates workout while evacuating from the hurricane. Left to right: Anastasiya Goers, Carrie Pagès, Lais Centeno, Andrea Nichols. Florence did not end up making landfall until Friday, and only she hit as a category 2. We felt so much relief that she was downgraded, but soon realized the impacts of the massive and slow moving storm would still be devastating. Watching the Weather Channel was an obsession that came with so much sadness. Seeing the destruction that Florence left behind was nothing compared to learning of the fatalities. It was awful. A couple of days went by and we were still in Charlotte because all roads in and out of Wilmington were flooded and impassable. Friends and clients were stopping by the studio to give me updates. The reports were that In Balance was “dry as a bone”. I was so relieved and spent the majority of the evacuation trying to make the best of the forced vacation. On the Sunday following the storm I received a picture taken through the window that showed the legs of the reformers with a water line that went up about 2 inches. That’s when we realized the carpet that looked dry as a bone at first glance was actually completely saturated. Flood waters had come through the back of the building and worked their way towards the front. I immediately burst into tears and felt a deep fear for my future, the future of my employees, and the future of my family. It was clear that the studio would have to close indefinitely. I was terrified. I have a pretty strong fight or flight response and flight was winning. I wanted to walk away. Plain and simple. It’s hard to look at the devastation and imagine that we would ever get back to normal. Was it even worth trying? Should I just go work for someone else? The questions in my mind never stopped. I’m generally a positive thinker but at that time all I could think was the worst. Then what’s going on in the photo above happened. Marc and I were moving the contents of the studio to the parking lot while these guys were working to remove the soaked carpet. I was watching them work and thinking how much they needed Pilates. Even in this ridiculous crisis I was assessing their posture, movement patterns, and the type of session I’d put them through!!!! I was annoyed with myself because I should have been focused on getting all of my equipment and props off of the soaking wet carpet. During a much needed break they were standing outside and looking at the equipment *respectfully* so I said, “Let’s go!”. I had them do a standing chest opener with the Roll Down Bar and the hamstring stretch you see in the picture. They loved it. They asked questions. I cued them. They listened. It was in that 10 minutes I remembered why I love teaching Pilates. I didn’t think about whether I was teaching classical or not. I didn’t stress over using the apparatus the way Joe intended…I just wanted these exhausted men to move so they felt better. This is why I will fight and not fly. I will keep In Balance open and share the Pilates method with our community because whether I like it or not, it’s what I am meant to do. This storm has confirmed for me that I DEEPLY love what I do. 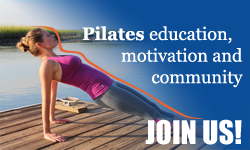 For me teaching Pilates is not about counting reps and teaching an order. It’s not about classical or contemporary. It’s not about teaching it right or wrong. As a matter of fact, I have realized that it’s not about exercises at all. It’s about getting lost in being fully present for someone else. When I cue my clients while looking them in the eye, they know they’re safe. I tell them they’re moving beautifully knowing they may not have heard that in a while. I make sure they know that I believe in them and hope that soon they’ll believe in themselves. I’m not doing it consciously. I’m not checking off a list. I sense what my students need, and I deliver it with all of my heart. I’m in the moment with them, and you know what happens when you’re fully present for someone else? You forget about your worries, stressors, and sadness. Our community has been rocked. Driving through town is sad. Everyday you see more and more houses with the entire contents of the home stacked 10 feet high on the sidewalk. There is furniture, drywall, toys, and memories in those piles. My heart aches for the families who live in the homes. I yearn for a day when the debris is picked up and I can begin to forget what we ALL have gone through. I have to admit though that I don’t ever want to forget what this experience has done for my perspective of what I do everyday. I need Pilates as much as my clients do. Maybe more. Carrie Pagès is the owner and senior Pilates Instructor for In Balance Pilates Studio. She attended high school at The University of North Carolina School of the Arts where she majored in Classical Ballet. While there she performed numerous lead roles and worked with prestigious choreographers and teachers. Carrie discovered the endless benefits of Pilates while rehabilitating an ankle injury and knew it would be a part of her life forever. She received her certification while living in Charleston, SC in 2000. In 2002, Carrie opened In Balance Pilates Studio in Wilmington, NC and founded the In Balance Pilates Teacher Training program in 2004. She is also the winner of the 2016 Pilates Anytime Next Instructor Competition. Along with traveling to studios all over the country to teach workshops and master classes Carrie is a presenter for Pilates On Tour with Balanced Body. In 2018 she presented at the Pilates Method Alliance Annual Conference. Her recent project CarriePagesPilates.com is an online studio designed for instructors looking for inspiration and motivation.